Love your neighbor, change the world. 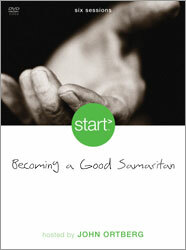 Partnering with World Vision, Zondervan presents a new DVD study, Start - Becoming a Good Samaritan- an unprecedented program created to help us live out Christ's love in world-changing ways, right now, right where we live. John Ortberg is your host for six emotionally-packed sessions (approx. 180 total minutes) featuring many global leaders including: Eugene Peterson, Philip Yancey, Charles Colson, Archbishop Desmond Tutu, Rob Bell, Shane Claiborne, Kay Warren and many others. Visit www.juststart.org to view video clips, fuller descriptions of each session, to learn about the growing list of international supporters and to access supplemental, online resources for the DVD curriculum. start>Becoming a Good Samaritan is an unprecedented initiative to help Christians live out Christ's love in world-changing ways right where they live. This groundbreaking training program helps small groups, families, entire churches, and organizations of every size explore the most pressing issues of our time then start actually doing something about them. Designed for use with the start> Becoming a Good Samaritan DVD, the start> Becoming a Good Samaritan Participant's Guide takes Christians out of the pews and into the streets where, as the hands and feet of Christ, they will live out the gospel, positively impacting those suffering from poverty, social injustice, pandemic diseases, and more.